Check out my latest find ...they have the best stuff right now. They had these great little boxes in different sizes, two look like they are about reading glasses size. The other would make a great trinket box. Or gift box. Then I found those great stamps. 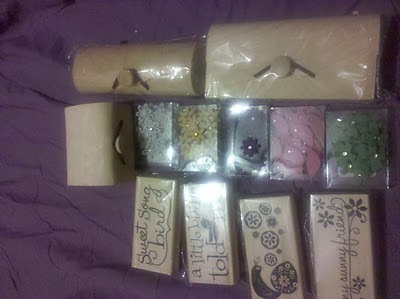 They about 4"x2" nice big ones and so cute. I got four out of the six designs I saw. And those little cute felt confetti they have. Perfect for layouts, cards, altered art and more. There is a close up pic below. 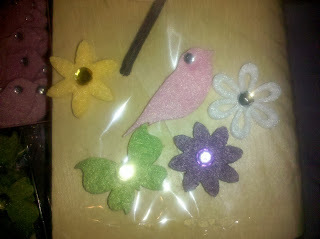 Close up of the felt confetti, they come 24 pieces to a pack. Love them. 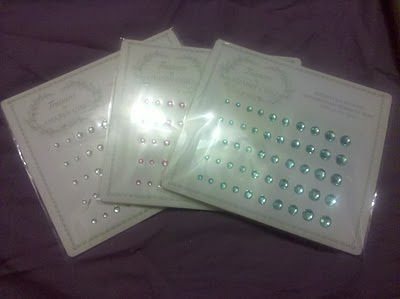 Oh and these great shabby chic colored gems. They are so pretty. I missed getting the green ones. I got Pink, Clear and Teal Blue. ﻿And they had so much more stuff. I had to hold back.